I talked with a girl named Ana. She sat near the place where we presented, but when I asked her if she understood the dramas, she answered that she hadn’t paid any attention to what we were doing. She then asked me what church we belonged to, if we were Christians or from the Catholic church. She explained that she didn’t go to church anymore because all of the people there were hypocrites: In church they would show one thing and outside they would be someone completely different. She told me that her family went to a church, mainly her mother, but that everything was a lie, because her mother didn’t live an honest life, since she would treat everyone in her way in a mean way, even after just leaving church. After listening to her, I shared my story with Ana. Of how I had hated my dad after he left our family, but that God had helped me forgive him and when my father got sick I had been the first one to be at his side to take care of him till he died. 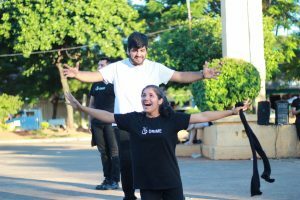 Ana then mentioned that she had been in the ministry of dancing in church, but had left that behind because of all the problems she had with her mother. I encouraged her to forgive and to remember that she is part of a chosen generation and that God has called her to live with purpose. That this “chance encounter” at the plaza was not a coincidence at all, but that it was God calling out to her “Come back to me!”, reaching out with his arms of love. 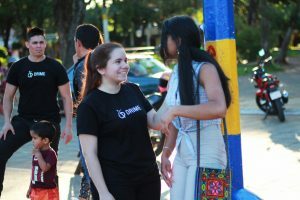 Please pray with us that Ana and other people who talked with us or saw the dramas could feel the loving arms of God and get to know him in a personal way. To learn more about DRIME Asunción, follow them on Facebook or Instagram.